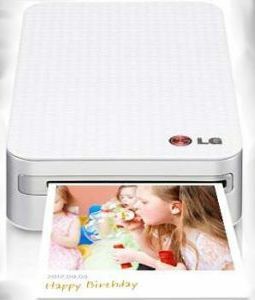 LG has launched PD233 Pocket Photo Printer in India at Rs. 14,990. The name says it all, this device is a portable mini printer that can even fit in your pocket. The printer supports 2x3 inch prints and is capable of delivering them in 313 DPI resolution. You can say the printer is best suited for printing photos which can be framed. The device supports NFC and Bluetooth and can work with laptops, android smartphones and even with iPhone and iPad. The printer uses Zink technology ( ink-less) to deliver the prints and the company says the device can print a copy within a minute's time. The printer even comes with a pre-installed application that will let you add effects and frames to pictures. The printer also can print QR codes on photographs. These codes can be read with any barcode scanning app, linking people to social networking sites or other online content. The LG PD233 is powered by 5000mAh lithium-polymer battery and is said to be capable of printing 25 pages in one charge. The company claims that the device can charge within a matter 1 hour and 30 minutes. Mr. Howard Lee, Director-Home Entertainment, LG Electronics India said; "Photographs are a part of people's life. It takes us back to the memory lane and helps us relive important moments. LG's innovative palm-sized PD233 Pocket Photo Printer is an apt product for our consumers as it will help them cherish these special memories in high quality prints. The photo printer just takes few seconds to print or share pictures Online once connected to any mobile device via Bluetooth or NFC (near-field communication)." Has a dimension of 2.9 inch x 4.8 inch x 0.9 inch (24.0 mm) and weighs in at 212 grams. 500 mAh Li-Polymer battery with capability of 25 pages in one charge.